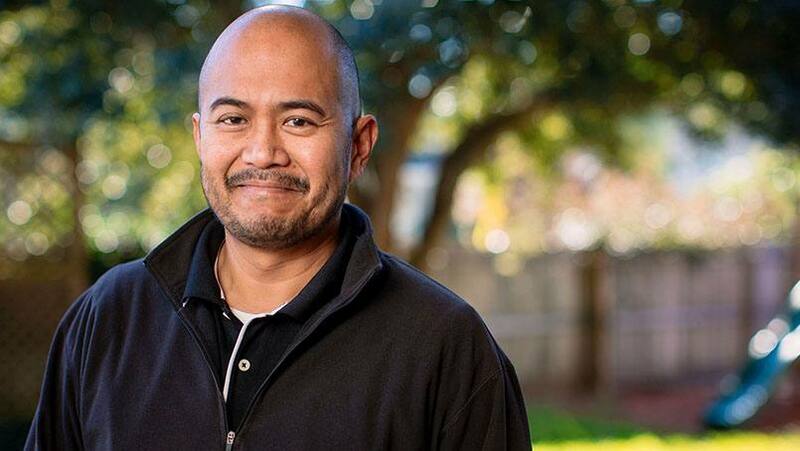 Fifteen years ago, Elmo Aquino, a resident of Orange Park, Florida, was an avid runner. He'd competed in Jacksonville's Gate River Run, an annual 15-kilometer running event, several times. But one morning in the summer of 2001, his active lifestyle came to an abrupt end when suddenly, while on a treadmill, he found he couldn't run. "I knew something was wrong, because I was used to running," recalls Elmo, now age 43. He knew he needed medical treatment. "I could have gone to some of the other hospitals," he says. "But with Mayo Clinic here in town, it was a no-brainer for me." Elmo was diagnosed with dilated cardiomyopathy — a condition in which the chambers of the heart become enlarged — and he ended up in the intensive care unit. That's where he first met Daniel Yip, M.D., medical director for the Heart Failure and Transplant Program at Mayo Clinic in Jacksonville, Florida. "Patients who have this condition typically have an enlarged heart with weakened heart muscle," says Dr. Yip. "They may develop congestive heart failure, which makes it difficult to carry out everyday activities." The most common cause of cardiomyopathy is coronary artery disease, and the most common cause for congestive heart failure is hypertension. Elmo didn't have either of those risk factors, however. His cardiomyopathy developed randomly. "Initially, we were able to control his symptoms with medication and followed him closely," says Dr. Yip. "Although his heart function never normalized, his condition improved to the point that he was able to return to work and lead a normal life." When that changed, he was happy to have the team at Mayo Clinic on his side. After connecting with Dr. Yip and his team, Elmo went back to his active lifestyle. He completed the Gate River Run for three consecutive years, resumed surfing, and even went snowboarding for the first time. "The overwhelming majority of people with this condition lead very productive lifestyles and either completely recover or are well managed with medical therapy," says Dr. Yip. "Only a small percentage of people need advanced therapy such as a ventricular assist device or a heart transplant, but it's difficult to predict which individuals will fall into which category." For five years, Elmo's health was steady. Then in July 2006, his condition worsened considerably. He was hospitalized for heart failure. "I was working full-time but had to quit. I was on a disability," Elmo says. "I was really going downhill fast." Within two months, Elmo became one of the 118,000 people on the national transplant waiting list. The wait time for a compatible heart was unknown. According to the United Network for Organ Sharing, 22 people die every day before a match can be found. Over the next six months, Elmo's condition deteriorated further. He was placed on continuous intravenous medication to control his symptoms. As Elmo's health declined, Dr. Yip and cardiologist Jeffrey Hosenpud, M.D. recommended a ventricular assist device, or VAD. This mechanical device is implanted in the heart to help it pump blood from the left ventricle to the rest of the body. The device could help Elmo live until a donor heart became available. In March 2007, Elmo underwent surgery to have a ventricular assist device placed inside his heart. "His organs were being severely compromised due to poor blood flow," says Dr. Yip. "So we had to intervene to ensure he would be in good condition when a donor heart finally became available." A few months after the device was implanted, Elmo experienced a transient ischemic attack. Also known as a "mini-stroke," the attack usually lasts a few minutes and typically does not cause any obvious permanent neurologic problems. As a result, Elmo moved to a higher priority status on the transplant waiting list. Then, at about 10 p.m. on June 3, 2007, Elmo got the phone call that is etched in his memory. A suitable heart had become available. Elmo was going to get his transplant. Despite a long and complex surgery, within a month of receiving his new heart, Elmo ran a 5K. "I wanted to prove to myself I could do it," he says. Overall, not only did his quality of live improve, but Elmo and his wife were able to focus on expanding their family. "I tell people that I had the transplant in 2007, and my daughter was born in 2008. Then my youngest son was born in 2010. I think Mayo did a pretty good job on my heart," he says with a laugh. "Every moment with them — whether it's waking them up or picking them up from school — is great!" he says. "Some people just take that for granted. It's really just looking at everything and knowing that you got a second chance." Previously a project manager for two regional construction and building firms, Elmo took advantage of his second chance at life and launched his own business. Today he owns and operates Aquino Construction Company, a business that focuses on general contracting and underground utility work. "I couldn't imagine myself not being a business owner," Elmo says. "It's allowed me a lot more freedom to spend time with my children and family, and that truly makes me happy,"
Dr. Yip is thrilled to see how far Elmo has come. "Just because you have a serious condition like Elmo had, it doesn't mean you can't live a vigorous life," he says. "The most memorable things about Elmo happened to his life afterward. He had two additional children after transplant. He went back to work and then started his own business. 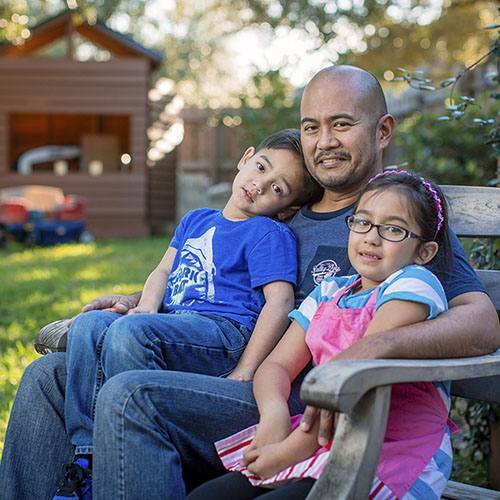 He took full advantage of the gift of a heart transplant and is living a full life." Since his transplant, Elmo has made it a priority to support others who are considering or awaiting a transplant, and he tries to helps them understand what the experience is like. He has been part of a transplant support group since 2001. "It helps the people going through the transplant process see someone who's been through it," he says. "It gives them the motivation and attitude to get through this tough time." Elmo has also participated in the American Heart Association's annual Heart Walk for the last 15 years. "It takes you back to the first time you were sick and how far you've come," he says. He enjoys seeing members of his Mayo Clinic care team at the event. Even though years have passed since his transplant, Elmo still has an enduring appreciation for the staff's care and attentiveness. "It's great to see my fellow patients and that they are doing well, but also to connect with all of the medical staff who helped me through my transplant," he says. "From the doctors to the nurses to the physical therapists, everybody wants to do what's best for the patient. That's what makes Mayo different in my eyes. You feel like everyone cares about you. They make you feel like you are their main priority above anything else." Hear from Elmo Aquino in the video below. 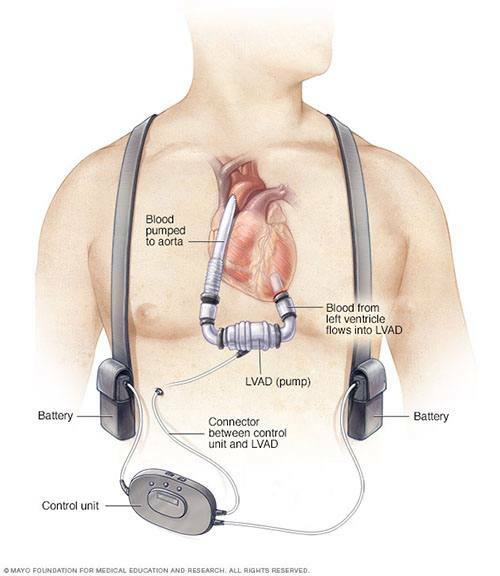 Learn more about heart transplants and ventricular assist devices.